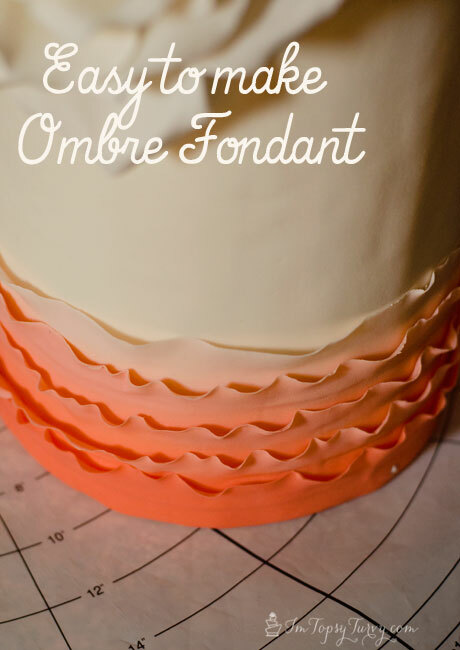 This is just an easy/short tutorial on how to make ombre fondant! I use this technique all the time to get a wonderful, gradual, color change for a ton of cakes, like this purple cake for Better Homes and Gardens, and the ombre ruffles in the picture below. Trying to gradually color multiple balls of fondant is tough. I mean coloring them is easy, but getting the gradual change down can be really hard, and time consuming. You’ll go too dark one step and not dark enough the next, GAH, it’s frustrating. So this way is easy. Start by simply mixing your lightest shade and darkest shade, don’t bother with the inbetween yet. In this case white and orange. 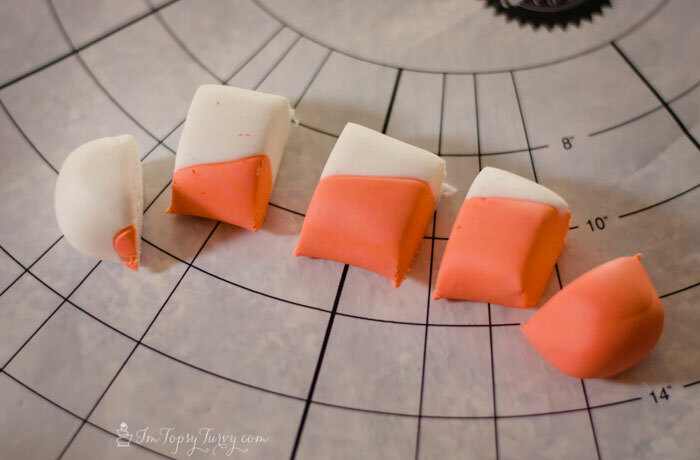 Then placing them next to each other roll them into a log, leaving one end all orange, the other end all white and the inbetween with create a diagonal line, or a nice gradual increase. DON’T over work it. Then cut it in to 5 equal pieces, with your lightest color and darkest color being by themselves (with little or none of the opposite color left on those end blobs). In this case I left that bit of orange in the big glob of white to add a smidge of color, but if your happy with your light shade you can simply pull that off. Then knead the colors together! Voila, way simpler and MUCH faster than trying to achieve this one at a time! 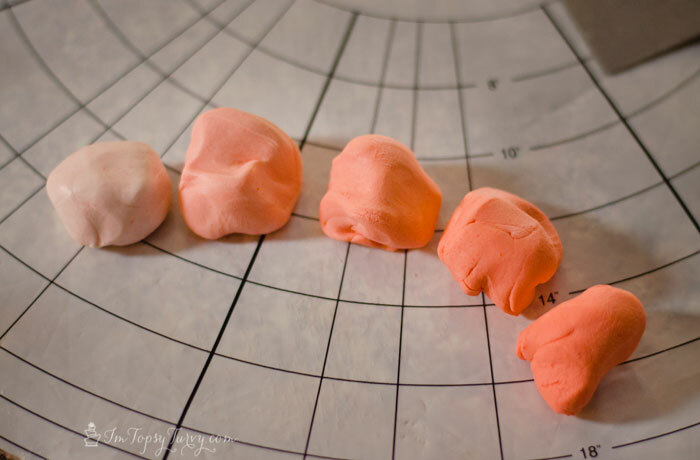 You have a great gradual change between each of your blobs, and your ready for decorating! Wow, I would have never thought of that! Thanks for sharing! your so welcome! It’s really so easy! This is awesome! It’s so pretty, I want to give it a try. Thank you so much! There is so much you can do with ombre, but I do love this ombre ruffle look! Genius! What a simple way to get the ombre look. Thanks! It’s soooo easy, esp when your using more than one gel to get the color you want! 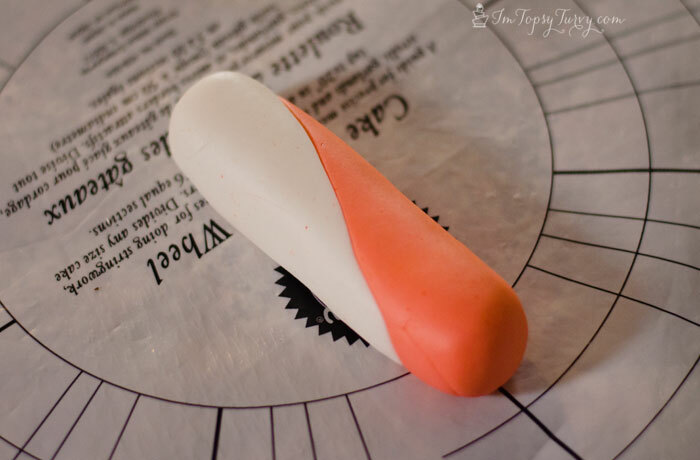 I am afraid to go near fondant – I’d probably make a mess of it all. One day, when the kids are tired of me, I’ll go to a cake decorating class! Thanks so much! And don’t be afraid, fondant is super fun to work with, and you know I not only teach here in Utah but I also teach online classes! How do you get flat ombre when covering a round cake?